The call by the Muslim Brotherhood for a government of "national unity" may be an effort to allay foreign and domestic fears, but it also creates hope for many. 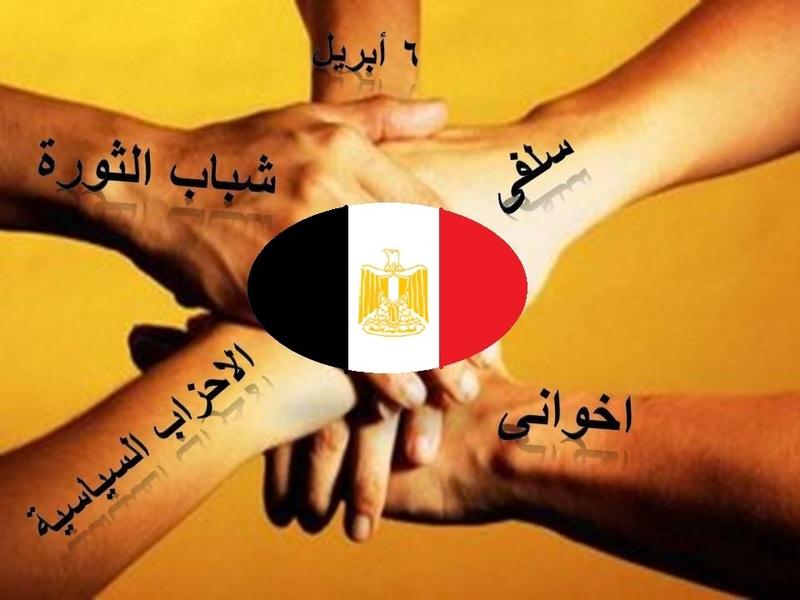 The hands in this graphic are labeled (from top, proceeding clockwise): April 6th, Salafis, Muslim Brotherhood, Political Parties, Revolutionary Youth. Free elections in Egypt won the Muslim Brotherhood 48% of the vote and gained 22% for the Salafis, but this has not been taken by either group as a mandate to recreate the country according to some version of shari’a law . It’s still the economy not ideology that motivates Egyptian voters in this period of change. Both the Salafists and the Brotherhood are aware that their elections owe more to a trust in their honesty (as pious Muslims), their organization, and their longstanding opposition to the Mubarak regime than to any desire for an Islamic state. 54% of Egyptians in a recent Gallup poll said it was jobs and the economy that are most important for the new government to deal with. Only 1% called for the implementation of Shari’a in the same poll. And economic change requires that the new Egypt not make any abrupt break with its Western allies, especially the US. The Muslim Brotherhood’s call for a “national consensus government” – which means an alliance with some of the liberal parties — stems from the organization’s recognition that a partnership with secular parties would ease concerns in the US that could lead to a reduction in US aid. (It will also help soothe domestic concerns that the very folks who sparked the revolution that led to the fall of Mubarak will be left out of the constitutional reform and leadership process). But the Brotherhood also faces real challenges from within, as it tries to balance its base–some of whom might cross over to the Salafist camp if they think the Brotherhood has strayed too far from its roots–and from its youth leadership, many of whom want greater transparency and democracy within the organization, and look to Turkey as a model for Egypt. To show their new focus on the economy, Brotherhood leadership met shortly after elections with hotel owners and foreign tour operators to renew its commitment to the tourism industry, and to promise not to implement a ban on alcohol and bikinis, as has been called for by some sheikhs. Tourism is down by more than thirty percent and is central to the Egyptian economy. The Brotherhood has pledged itself to reign in corruption and reduce the bureaucratic red tape that hobbles so many Egyptian enterprises (and about which I write in detail in Connected In Cairo). Interestingly, as an article in the Wall Street Journal pointed out, they are reaching out to multinational corporations—widely mistrusted because of their ties to the crony capitalism of the regime, and to international banks, in spite of the fact that these practice non-Islamic (i.e. interest-based) lending. The Brotherhood has even come out in favor of a loan from the International Monetary Fund. The Palestinian issue was the first to be sacrificed on the altar of this newly-founded Islamist “realpolitik.” The Brotherhood leadership was quick to assure the United States that it will abide by the peace treaty with Israel, as it was reported by State Department Spokeswoman Victoria Nuland. And even the Salafis, who have an interest to outbid the Brotherhood on this issue, indicated through their Spokesman Yousry Hammad that they are not embarrassed to talk directly to Israeli radio to announce the party’s commitment to abide by the treaty. There is a lot riding on this. The real question is what will happen five years from now if most Egyptians do not feel that the economy is getting better, and is now benefitting all Egyptians and not only an elite.